Back to school means back to a routine — but between work, school, homework, and afterschool activities, it’s hard to find time to prepare a balanced meal for your family, especially if everyone is eating at different times. Here are some time-saving healthy recipes that will please everyone in your family. This recipe takes less than 10 minutes to assemble. If your kids come home hungry from school but aren’t quite ready for dinner, this is a great snack to serve with whole grain tortilla chips. 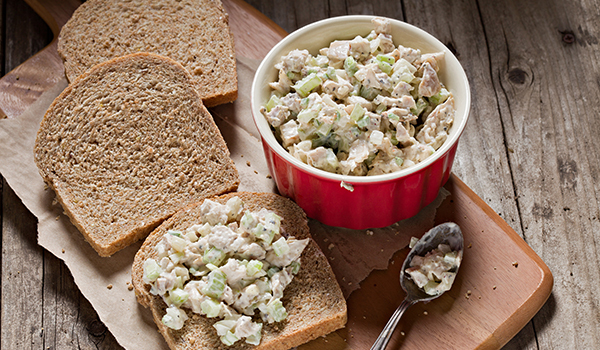 After evening sports or activities, this dish makes a great entrée over salad greens. Use leftovers as a sandwich filling for lunch the next day, using a tortilla or lettuce wrap. Pressed for time? You can use leftover chicken or a rotisserie chicken from the store. Combine all ingredients in large bowl. Cover and refrigerate until ready to serve. Lean beef, low-fat cheese, and roasted veggies make this a weeknight winning recipe that takes less than 10 minutes to prepare. Serve on slider rolls for an afterschool snack or whole-grain hoagie rolls for a dinner on the go after sports practice. Preheat oven to 350 degrees. Place flank steak on a baking tray and season with salt and pepper. Drizzle olive oil and Worcestershire sauce over the top of the flank steak and rub it in. In a large bowl, combine peppers, onions, and mushrooms with olive oil, additional Worcestershire sauce, salt, and pepper. Stir to combine. Spread vegetable mixture around the outside of the baking tray, around the flank steak. Bake for approximately 15 minutes, then broil for 3-5 minutes. Remove the flank steak from the tray. Slice into thin, bite-sized pieces. Place meat back into baking tray. Cover the flank steak and vegetables with slices of cheese. Bake an additional 5-7 minutes at 350 degrees. Stir well to combine meat, vegetables, and cheese. 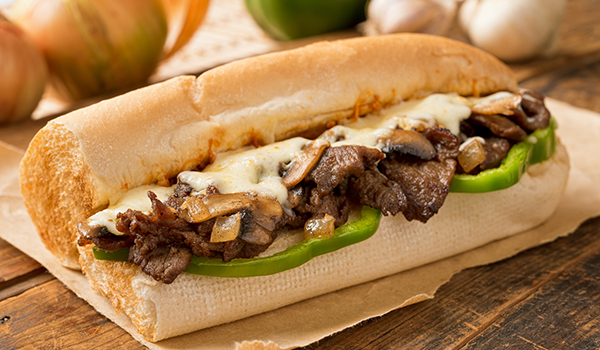 Serve on slider or hoagie rolls. 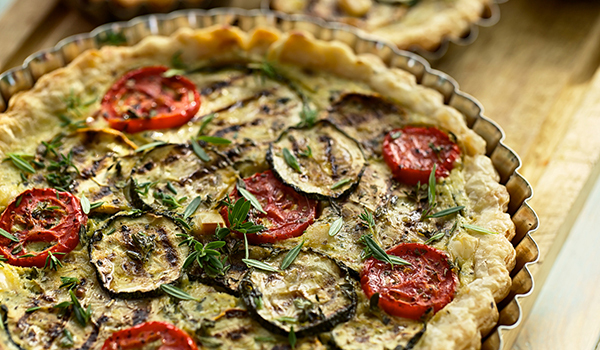 Savor the last bit of summer by using the zucchini and tomatoes from your garden to make this quick and easy tart. You can make this ahead of time and serve it warm or cold. The kids can grab a slice on the way out the door and eat another slice of this delicious tart after sports practice. Preheat oven to 375 degrees. Line an 11-inch baking pan with the pie crust. Sprinkle zucchini slices with salt and let rest at room temperature for 15 minutes on a cutting board. Slice tomatoes in half and set aside. In a medium bowl, whisk eggs, yogurt, and olive oil together and set aside. Pat the zucchini slices dry and lay half of them in the bottom of the pan. Sprinkle with feta and half of the pine nuts, and top with the rest of the zucchini. Arrange the cherry tomatoes in a circle around the pan, sprinkle the remaining pine nuts on top, and pour egg mixture into the pan. Grate the parmesan cheese over top of the tart and bake for 40 minutes. Let cool to room temperature before slicing. This fresh and delicious salad is simple to make, since the marinade doubles as the salad dressing. The filling can also be used for burritos or tacos later in the week. Combine cilantro, lime juice, olive oil, honey, chili powder, salt, and pepper in a blender until smooth. 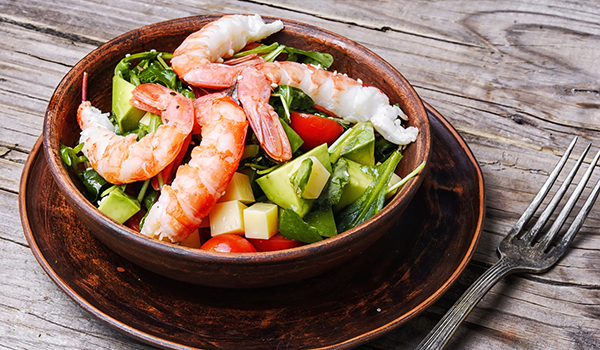 Place shrimp in a plastic bag and add 3 tablespoons of blended dressing. Marinate for 10 minutes in the refrigerator. Sauté shrimp in a non-stick pan sprayed with cooking spray for 1-2 minutes on each side. Set aside to cool and discard remaining marinade. Divide red cabbage and lettuce between serving plates and top each salad with tomatoes, shrimp, avocadoes, and crushed tortilla chips. Drizzle remaining dressing over each salad before serving. With a little planning and creativity, you can serve a quick and delicious meal to your family no matter what their schedule is this week. Fueling your kids before and after activities is key component of enhancing their performance and sustaining their energy level throughout the day.